I didn’t know Sev could do intelligent creatures! I thought he was limited to animal-human and back?! (The aberrant is an outlier and should not be included) Better than a Druid! My guess is that he did a wolf who looks a lot like a moonwolf. Which really shouldn't have worked, but apparently just barely did. Jonan as a moon wolf is giving me some "Scar" (from the Lion King) vibes. I love how he put his paw over his eyes - my cats do that too sometimes when they are trying to sleep and I have the light on. Who else is 100% sure Jonan would bite/swallow Sev if his mouth wasn't sealed tight? Good job with that quick casting, Sev! I'm intrigued by the markings on the Muulorn. The locals glow that bright blue, but is it any more than inate magic and/or identifiers? I love that Jonan's markings, though weak, still give him that scowling eyebrow look, although there isn't any getting away from that impressive nasal development, is there?! His hair is still tipped with red, so I'm assuming Muulorn (from other areas, maybe) can have different coloured pelts, or else they are assuming it is due to his 'illness', as there is only one runecaster amongst them. Lovely shading, as usual :) Looking forward to seeing if they get out alright, or finding out why the Muulorn are holding so many runewriters! What a good wuff jonan!!!!! And the tiny sev under the pillow...... too cute. Or he could have scrawled the rune on his earring like he did when he was stuck on the tower a couple scenes back, and cast it from there? Though, I seem to recall that not working entirely well. 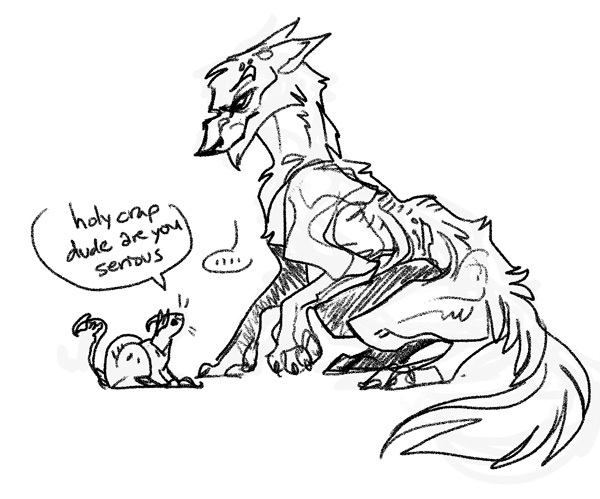 Omg WOLF JONAN i kinda hope he stays like that for a couple pages at least... also this just gave me an idea: what if Sev transformed Jonan into a frog, since they can absorb fluid through their skin? Might buy him more time.